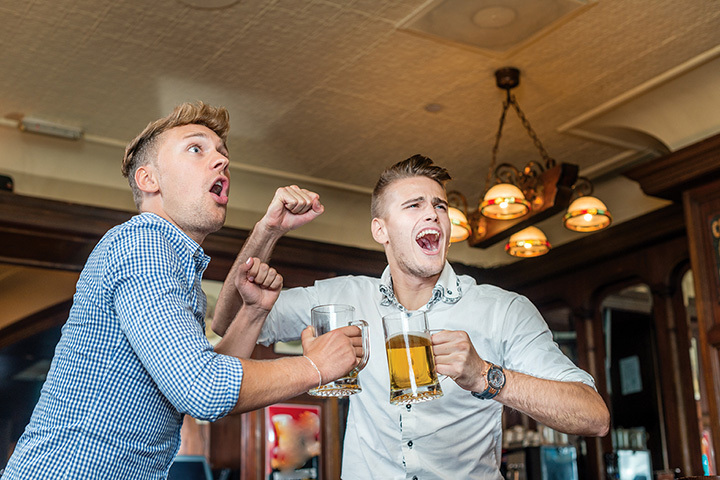 The 9 Best Sports Bars in Kentucky! What’s better than meeting friends at your favorite sports bar and enjoying a great meal and a cold brew while watching your team play? Kentucky has some of the best sports bars around and a very loyal following of teams. Join friends and family and other sports-minded folks at any of the nine best sports bars in the state and cheer on your team. If you’re looking for a great place to watch your favorite sports team, stop by Winchell’s in Lexington, Kentucky. For more than 25 years, Winchell’s has been family owned and operated. Find the best locally-sourced ingredients for homemade favorites like Kentucky Hot Brown, pulled pork sandwiches, Bourbon-marinated pork chops, and country-fried chicken. When it comes to adult beverages, you’ll find a nice variety of draft and bottled beer, wines from California and Australia, and handcrafted cocktails. With 30 flat screen TVs all around, you’ll never miss another game. Featuring a great menu of bar food favorites like chicken and waffles and other Southern-inspired delights, and a selection of classic domestic beer that will make you smile, Griff’s is among the best. Owned by and named after Louisville’s legendary NBA player Darrell Griffith, this casual upscale bar has an impressive menu that includes the sports figure’s favorite burgers, soups and salads, appetizers, wraps, entrees, and enough large screen TVs that you can watch multiple games at the same time. Open every day, Crewitts Creek has been home to basketball for the University of Kentucky for over 25 years, and serves menu items like blackened shrimp and grits, chicken and dumplings, and meatloaf, and gourmet burgers. Featuring favorite and specialty beer, wine, and cocktails, this place is American comfort redefined. Pub by Novo isn’t your average sports bar. With a menu that features elegant food, craft beer, and signature cocktails, if you add big screen TVs, a lively environment, and great customer service, you’ve got a win-win combination. Open every day, the Pub by Novo in Bowling Green, Kentucky, offers such amazing palate teasers as bison burgers and duck wontons, and the servers and bartenders are very friendly and quick. Cold beer, awesome wings, and a great family atmosphere. That’s what people are saying on social media about Hometown Heroes Sports Bar in Dayton, Kentucky. Open every day but Sunday, this bar encourages a good time with good food and service. Of course, the large screen TVs scattered around don’t hurt the cause. Prices are reasonable and the menu includes traditional bar food favorites like wings and fries that are on point and fast service. Smokin’ Joe’s Sports Bar & Grill, located in Richmond, Kentucky, is a hot place for fun and entertainment, surprisingly good food, lively karaoke and music, and one of the best places to watch your team play on one of the many TVs in the place. Daily food and drink specials help take the disappointment away when your team doesn’t win, and the atmosphere feels like home. Known for great bar food, cold beer, and a place to cheer on your favorite team, Dickmann’s in Fort Wright, Kentucky, works hard to be THE place to come watch the game, no matter the game you love. Try anything on the menu and you won’t be disappointed. Want something traditional while you watch the game? Try the chicken wings. Feeling extra hungry? You can’t go wrong with any of the half-pound burgers or pizza. All your favorite beers are available on tap from Angry Orchard to Blue Moon to Yuengling and more, and bottled beer features pale ales, stouts, and aged IPAs. According to the mission at Longnecks Sport Grill, every night is special and game days are legendary! Stop by any night of the week and see for yourself. Get $5 pitchers of domestic beer and play a free game of pool on Monday nights. Tuesdays bring $2 beers, Wednesdays and Thursdays have drink and food specials, weekends include Feel Good Friday and Saturday game nights, and Sundays are the best day to watch the game and enjoy live music. Dozens of tables in a single room with TVs on every wall mean you won’t miss any game you’re watching. Brothers Bar & Grill in Newport, Kentucky, has earned a great reputation for being the place to go for good American comfort food and a friendly setting for watching your favorite game. The year was 1967, and the idea behind Brothers came from the neighborhood tavern where people would stop by to enjoy being with friends, a cold drink, and reasonable prices. With over 40 new and traditional beers on tap and draft, there’s also a selection of cocktails and liquor to quench your thirst. Appetites can be satisfied by any one of the special burgers and sides, and popular favorites include macaroni and cheese, burritos, fried chicken, tacos, and fish.